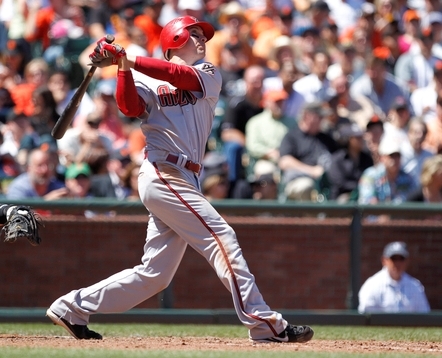 Last season, Kelly Johnson made quite a first impression on Arizona. In his first season in the desert, he posted a .284 batting average while achieving career-highs in home runs (26) and RBI (71). Johnson saw much different results throughout the first month and a half of the 2011 season, though. He hit below .200 and struck out at a rapid rate. Those struggles appear to be coming to an end after Johnson caught fire at the end of May. In his last 21 games, Johnson is batting .291 with six home runs, seven doubles, and 16 RBI. D-backs Insider sat down with Johnson to discuss his red-hot bat and his team’s ascension into first place in the NL West. DI: So after a slow start to the season, is it encouraging to you to return to your old form at the plate? KJ: Yeah it is. It feels like a long time coming just to get going and help this team do some things. It’s coming at the right time though because we’ve been playing great and we’ve been winning a lot of games. DI: Not only have you been swinging it well, but also guys like Justin Upton have been swinging well. Do you think a strength of this team is having a lineup that can pick each other up? KJ: Yeah, and all the way down to the last guy on the bench, anybody that’s got to pinch hit on a given night. We got a team that’s got a lot of guys that just step right in and not miss a beat and are great players. It’s good that we have such a deep roster and a good team. It’s never just going to be one guy, and I think that’s a very big strength of this team. DI: What else do you think could help you guys continue May’s success into June? KJ: I mean you’re not going to go on streaks like this all the time. What’s going to help you be consistent and win a lot of games is just continuing to have the pitching we’ve had. The bullpens pitched great, and just having some timely hits and scoring some runs. We’ve been in a lot of games all the way through to the end, and we found a lot of ways to win them more recently. DI: Some people aren’t buying into the D-backs just yet, but is flying under the radar a thing that you think this team is comfortable in doing? KJ: Yeah, you got to earn having the expectations and having people believe you. So if we’re playing like this and it’s all the way in September and we’re going to the playoffs that’s good enough for us, then years after we can be expected to win and then go from there. So right now we’re in a position to be in and we’re leading the division and starting a new month. We just want to have the same success in June that we had in May.